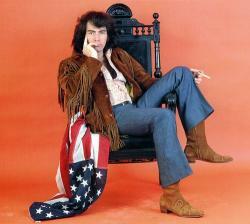 Neil Leslie Diamond (born January 24, 1941) is an American singer-songwriter with a career that began in the 1960s. Diamond has sold over 125 million records worldwide, making him one of the world's best-selling music artists of all time. He is the third most successful adult contemporary artist on the Billboard charts behind Elton John and one-time duet partner Barbra Streisand. His songs have been covered internationally by many performers from various musical genres. Diamond was inducted into the Songwriters Hall of Fame in 1984 and into the Rock and Roll Hall of Fame in 2011. Additionally, he received the Sammy Cahn Lifetime Achievement Award in 2000 and in 2011 was an honoree at Kennedy Center. On the Hot 100 and Adult Contemporary charts, he has had eleven No. 1 singles: "Cracklin' Rosie", "Song Sung Blue", "Longfellow Serenade", "I've Been This Way Before", "If You Know What I Mean", "Desiree", "You Don't Bring Me Flowers", "America", "Yesterday's Songs", "Heartlight" and "I'm a Believer". He continues to record and release new material and maintains an extensive touring schedule.